The Fish Farm was developed in response to observed environmental, economic and social trends in poor communities. With increasing urbanisation, high unemployment, rising transport costs, a deteriorating marine environment, and global warming affecting food security, we have to start thinking differently about how and where we grow our food. The Fish Farm is the answer! 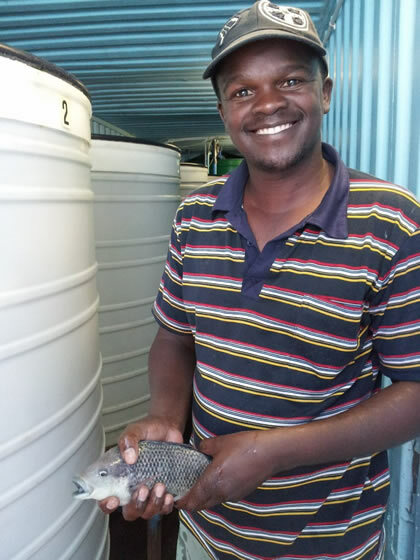 By growing food close to where the vast majority of people live, The Fish Farm positively addresses many of these dilemmas. For the first time globally, profitable small scale but intensive fish farming has now been introduced to the inner city and urban areas. From poor communities in small towns to large cities, the global growth industry of aquaculture is now available as a small business opportunity. Aquaculture, until now, has mostly been restricted to large, low-employment operations with fairly high financial and technical barriers to entry. Now, as an example, instead of one fish farm producing 400 tons of fish, The Fish Farm empowers 100 individuals or families to produce four tons each, profitably, right where they live. The result is the same – 400 tons – but more people and communities are involved.